Valentines day is rapidly approaching, which means romance, gifts and pulling out all the stops. We know that once you have a family, it’s easy to get caught up in everyday life, resulting in spending quality time with your significant other becoming less of a priority. We think, Valentines Day should break this cycle, and what better way than a little getaway just the two of you. We’ve done the hard part for you and found the best getaways (something a little different) to celebrate the occasion. In Northern Lapland, 260 km North from Rovaniemi is the quaint village Saariselkä. 27km from Ivalvo airport, it is situated by the Urho Kekkonen National Park, deep in the heart of Lapland with around 7000 inhabitants (combined with Ivalvo). You may have the impression that Lapland is only a place for kids at Christmas, however Saariselkä proves this perception wrong. Its charm creates an authentic adventure for couples, adding a sprinkling of romance to your getaway weekend. With a fantastic local infrastructure and a variation of accommodation from hotels to an igloo village, there is no better place to explore Winter at its finest than here. Attractions include husky sledding, snowmobile safaris, cross country skiing and the cherry on top of the trip…The Northern Lights. 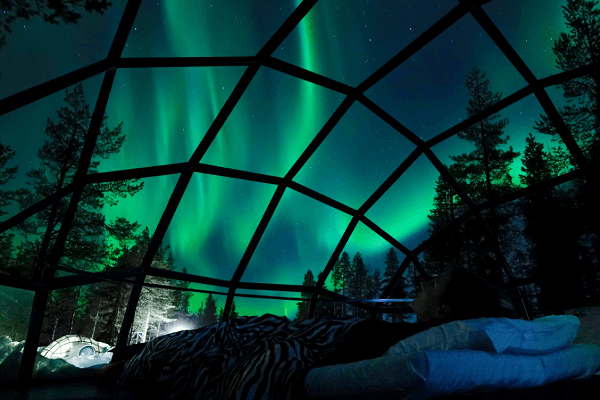 We recommend staying at the Artic Resort Kakslauttanen, a glass igloo village. What better way to gaze upon the spectacular Northern Lights than from the comfort of your stylish igloo, equipped with a fireplace to keep the cold night out, private sauna and own personal kitchen (to ensure you aren’t in short supply of nibbles). Within this region of Finland, it is common to see the Northern Lights almost every night, so rest assured you will witness the beautiful display during your stay. We think nothing beats sleeping under the stars, especially with your loved one, don’t you agree? If a getaway with a bit of a chill factor is not on your agenda, then why not a destination where you can be replenished by that much needed winter sun? 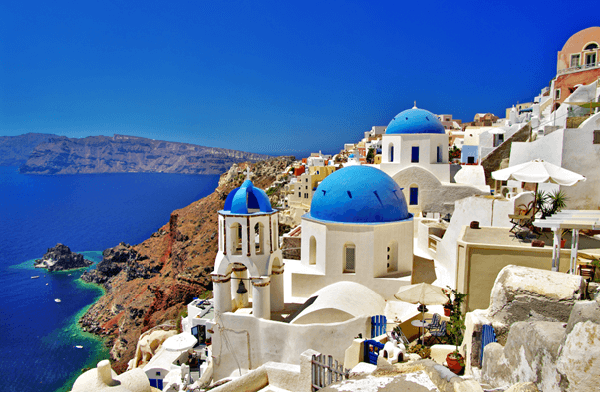 Located within the Aegean Sea, Santorini (or Thera as its officially named) is a small yet gifted Greek island, which now holds the title as one of the most romantic getaways in the world. Whilst it’s far from an action-packed holiday, it gives you time to relax, indulge in good food, enjoy good company, and immerse yourself in the beauty that is Santorini. With its stunning landscapes that’ll exceed your imagination to its Cycladic architecture that’ll leave you lost for words, Santorini’s beauty is more than skin deep, with its charm recognised and adored worldwide. Visiting the Island during the winter months provides a far more authentic Greek experience, than during the summer where commercialism is on the high. The atmosphere becomes less touristy, allowing Santorini to truly be appreciated for what it is. Of course, people live on the island year-round, so many restaurants and hotels are still open for business (however be sure to book in advance). We recommend staying in the village of Oia, a photogenic town, with a maze of unique and quaint shops, restaurants and cafes. The breath-taking views are its greatest asset, where ever you go you’re sure to be mesmerised by the island’s beauty. There are a number of hotels located here, many of which are the most popular on the island, and during February you’re sure to get an exceptional deal! So, if your looking to just relax and appreciate an island worlds away from a typical overcrowded beach holiday, Santorini may just be the perfect getaway! Planning a getaway can be stressful, resulting in heated debates between you and your loved one about where is the best place to go. As an alternative, why not add an element of surprise into the mix? There are a number of pioneering travel companies who arrange trips to secret destinations, and the unsuspecting traveller doesn’t become aware of where they’re going until they’re at the airport- this takes spontaneity to a whole other level. The booking process is relatively simple, you’re asked questions regarding what kind of getaway you’re after (such as a city break), your budget, the duration of your trip and when you want to go away and if there’s any places you don’t want to visit. Once they’ve received all your information, its out of your hands and your entire trip will be hand selected from destination to flights and accommodation. Whilst it is a constant guessing game as to the specific location (until you reach the airport), you are provided with hints of your destination a week before you depart, such as the expected weather during your trip, so no need to panic that you don’t have all the necessities. We understand this isn’t for everyone, however if you do feel like mixing it up and being spontaneous then why not pass the responsibility of booking a holiday over to one of these companies? It might just be the best thing you’ve ever done. For secret getaways (given that you don’t know your exact destination) we recommend a multi-trip policy, with cover available for anywhere within the UK, Europe and Worldwide. For more information click here. We think a getaway is the perfect way to spend Valentine’s Day! If you do go on one of the adventures we’ve mentioned (or any others for that matter) be sure to share your photos using #holidaysafeholidays.